Area Rug Dimensions in Overland Park, KS serves in the Greater Kansas City Metro Area offering you a Superior Selection in all price ranges and include hand woven, hand knotted, hand tufted, and machine loomed and woven qualities. Visit our showroom in at 127th and Metcalf Ave in Overland Park, KS and you’ll see Oriental Rugs and Oriental Runners as well as any other rug style such as Persian Rugs and more transitional and contemporary styles in Tibetan and Nepalese hand woven or hand-tied selections as well as lessor expensive machine woven and hand tufted selections. Area Rug Dimensions in Overland Park, KS displays all styles in our unique “gallery style” displays that make it very easy and relaxing for you to view Transitional rugs, Botanical rugs, Light and Airy designs, French Country styles, Arts and Crafts designs, Eclectic styles, and Contemporary rugs. If you have a more specific need that just isn’t already made, our designers at Area Rug Dimensions in Overland Park, KS will help you create your very own custom rug in order to satisfy every color, design, texture and size requirement and for any discriminating taste. 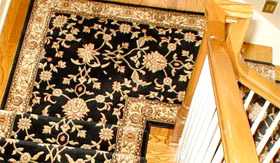 Serving the Greater Kansas City Metro area for more than 15 year’s Area Rug Dimensions is the most comprehensive area rug, oriental rug, custom rug and carpet store in the Midwest and Kansas City and Overland Park. Area Rug Dimensions offers you Superior Selection and Custom Design with in home consultations and stocks hundreds of rugs in our Gallery Style Showroom and has every shape including rounds, squares, ovals, hall runners and stair runners, octagon, abstract shapes. As your personal area rug consultant, we will visit with you at your home and learn about you and your interiors needs and then meet with you back in the showroom so we can really show you which rugs work the best and why. 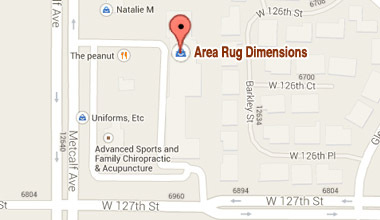 Area Rug Dimensions in Overland Park, KS is a company of DIMENSIONS INC. The Corporate address is the same as the Area Rug Dimensions showroom and store address which is 12623 Metcalf Ave, Overland Park, KS 66213. The Phone number is 913-327-8784. Founder and sole stock holder is Chris Bradford of Overland Park, KS. 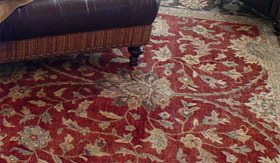 Chris Bradford has over 25 years of experience mastering every facet of rugs and carpeting. 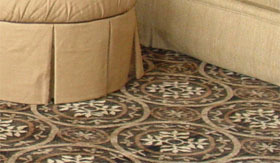 As a result of this experience and capacity Chris Bradford and Area Rug Dimensions in Overland Park, KS offers appraisals of any type of rug or carpet. Have you ever purchased a piece of furniture…even on sale, and 2 weeks later you see it somewhere else even less? As homeowner’s ourselves, WE have too! This is why Area Rug Dimensions has a lowest price guarantee, and we guarantee we will have your lowest price even for 30 days after you purchase. We are lower than the “big box” stores, furniture stores, and yes… even the internet. The mission and goal of Area Rug Dimensions is to offer homeowners and interior designers a one stop destination for any type of rug and in most any price range from ultra-high end custom to a more moderately priced machine woven rug. 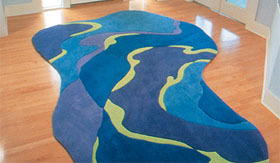 As your personal area rug consultant with a one stop destination and lowest pricing policy you don’t have to stop and think where to go based on what price point or type of rug you want, you just know to go to Area Rug Dimensions in Overland Park, KS and get knowledgeable and helpful people to work with you as your consultant and make your rug shopping experience as enjoyable as it should be and your interior as wonderful as it should be!